The Marching Leathernecks stop in front of the Alumni House during each Homecoming Parade to perform for alumni. 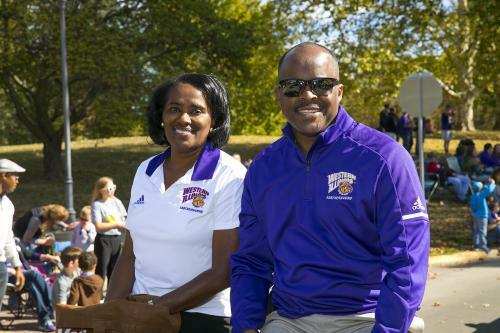 WIU President Jack Thomas and his wife, Linda are pictured in the 2017 Homecoming Parade. MACOMB, IL – It's time to get your game faces on and roll the dice on this year's annual Western Illinois University Homecoming celebration Friday-Saturday, Sept. 28-29. This year's theme is "Game On: Leathernecks Win It All." Homecoming Week kicks off with the annual painting of the paws on University Drive Friday, Sept. 21. Other activities include "Paint the Town" (Sept. 22), Rocky's Boat Regatta (Sept. 23), Variety Show (Sept. 25) Yell Like Hell (Sept. 27) and the WIU Women's Soccer Spirit Game (Sept. 28). A complete student activities-related schedule will be available at wiu.edu/uub. The Alumni Association's Homecoming weekend events begin Friday, Sept. 28 with the All Alumni Social from 5-9 p.m. at the Alumni House. Complimentary food, beer, wine and soda will be available, as well as a cash bar. Take a walk or run down memory lane at the "Old Stompin' Ground Runaround" 5K run/1.5 mile walk at 8 a.m. Saturday, Sept. 29, with registration beginning at 7 a.m. at the Alumni House. Exciting changes to this year's race include chip timing technology and participants will receive a commemorative moisture wicking/dry fit shirt. A reunion recognition brunch and social ($5/person), to honor the classes of 1968, 1978 and 1993, will be held at 8:30 a.m. at the Alumni House. 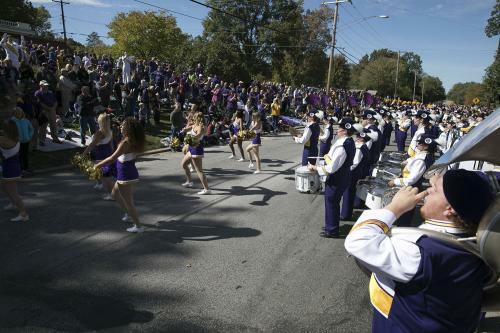 Alumni are invited to watch the WIU Homecoming Parade from the Alumni House. 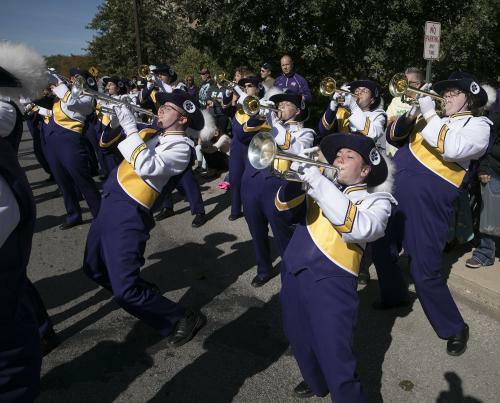 The parade, which begins at 10:30 a.m. from downtown Macomb, makes its way through the streets of Macomb, passing the Alumni House and ending at the corner of Adams Street and Western Avenue. WIU Alumnus George Baughman '60 '67 has been named the 2018 Homecoming Parade Grand Marshal, accompanied by Honorary Grand Marshal Col. Rock III "Rocky," who retired this year as WIU's mascot. At noon, an alumni cookout ($5/person) will be held at "The Right Place" tent in Q-Lot. Events conclude with the Leatherneck football game versus Youngstown State beginning at 3 p.m. at Hanson Field. Tickets are available in advance for $15. For more information about WIU Homecoming activities or to register for Alumni Association events, visit wiu.edu/alumni/homecoming.php. For more information regarding Office of Student Activities-sponsored events, visit wiu.edu/uubhomecoming.